My first pair of high heels was navy blue, and from Chandler’s on Queens Boulevard. They matched my dress for the eighth grade prom I was going to the following week with Gary Stein. They were so deeply unutterably uncomfortable. I couldn’t really walk in them (and didn’t understand how anyone else could either), and they also gave me blisters on the back of my feet. But walking wasn’t the point. These shoes were for looking at. Thirty seconds after I hobbled into the prom, I threw them off. Half a lifetime later, when I was on the Oprah Winfrey show for Women Food and God, I figured I needed a new outfit. So I went shopping in Chicago a few days before the show. I chose a simple black suit. All good. But then I needed shoes with a teeny heel (as I still can’t walk in heels). I found a pair of simple black shoes, had the pants hemmed to match the height, and that was that. On the day of the show, I brought the new black suit with my new shoes (still in a box) to the Oprah set and when I put them on, I realized they’d made the pants way too long, and that in the shoe box, were two left shoes. Uh-oh. I called one of the assistants, told her my story, and she sent two people to Neiman Marcus to return the shoes and bring back another pair—this time, with a left and a right shoe, and with a higher heel. The assistant returned with eight boxes of shoes, with ten minutes left until the Oprah show began. I was like Cinderella trying to find the shoe that fit—and only one did. Ahh. But it had such a high heel that once again, I couldn’t walk—and as there were now five minutes left until I had to walk onto the set, I decided the best thing to do was to ask for help. Tell the truth, as embarrassing as it was. I turned to the assistant and said, I can’t walk in these and they are the only ones that fit. I need help, and I can’t think of what to do, but maybe you can. No problem, she said. And the next second, two men appeared and stood on either side of me, told me to put my elbows on their hands, and give them my weight. Holding me two inches above the ground, we walked onto the stage. Me, looking as if I was walking but actually walking on air, and the two men, looking like my valiant bodyguards. They sat me down in the chair opposite Oprah. I crossed my legs so that my new impossibly uncomfortable shoes could also have some time on television. My mother says I looked as if I was born in those shoes. 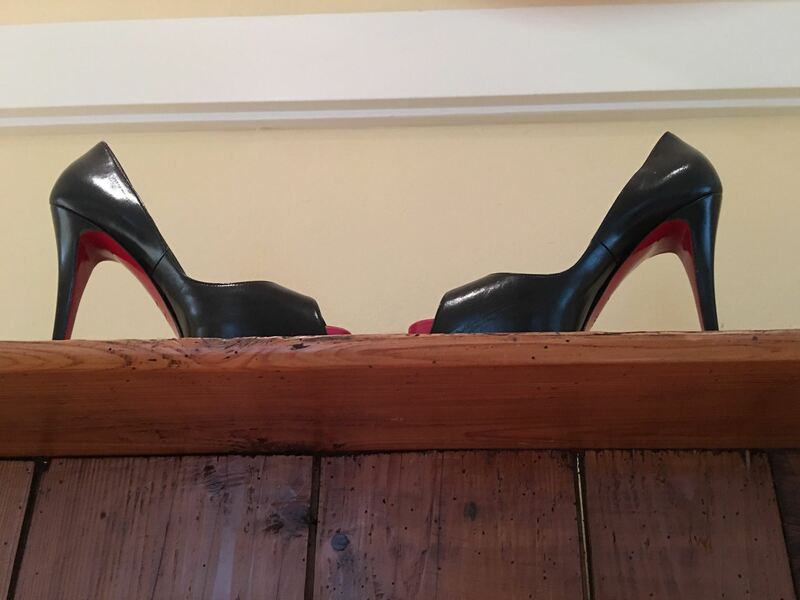 Now they grace the top of a wooden hutch in my dining room (see photo). I figure that if baby shoes can be bronzed, those shoes can have their place in my house. Along with reminding me of that fabulous Oprah show day, they are reminders that nothing is the way it looks. Just because someone is wearing high heels doesn’t mean she can walk in them. Just because it looks easy doesn’t mean that it is. Just because it looks like she—anyone—got there herself, doesn’t mean that a legion of people weren’t there, behind the scenes, helping, always helping. It’s good to tell the truth and ask for help. It’s good to remember that we never do anything by ourselves. And to have shoes ensconced in the dining room, to remind me that help is always available.